June 1st, 2019 will be Lemonade Day! It’s an opportunity for kids to learn the basics of running a business, marketing, and (hopefully) turning a profit. An offshoot of the national LD program, it began last year in Starkville, and its success – over 150 kids up to 6th-grade level took part, setting up 64 lemonade stands throughout the city – has led to expanding the local program to both Columbus and West Point. The Golden Triangle program leader is Jeffrey Rupp, director of outreach for Mississippi State University’s Center for Entrepreneurship. He’s hoping that the number of participants this year will double or more. Participants can now sign up online; they will receive a free workbook, which gives them the basics on starting a business, marketing it, and how to handle finances at a basic level they can understand. It also encourages kids to donate some of the profits to local charities in order to help others, which many did. The kids can also receive advice & feedback from local business owners. Last year, Cadence bank even offered $40 micro-loans to the budding entrepreneurs; Rupp said all of these micro-loans were paid back 100%. They will be doing so again this year. Main Street Columbus Director Barbara Bigelow said: “I thought it was just so cool,” she said. “… I love the program. 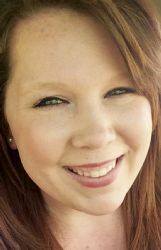 The whole premise beside it is to teach young people how to set up a business and follow through.” She is currently looking into obtaining booth spots downtown for the event, and she has reached out to local schools in order to solicit interest from students. “All you have to do is go buy lemonade,” Rupp said. “So it’s really easy for the public to get involved.” – And THAT’S Good for Business! To learn more about Lemonade Day or to sign up and volunteer, go to lemonadeday.org/golden-triangle. Click here for the FaceBook page for the event. Please click here to read the original article. Columbus Inn & Suites across from the Magnolia Bowl is up for sale to the right entrepreneur. The building, located at 506 Hwy 45 N, has 90 rooms, a fully-equipped restaurant, kitchen, pool and meeting areas. The asking price is $1.45 million. Window World recently opened its doors at 134 Lincoln Road, next to Walmart, earlier this month. It is part of a 200-store chain that services both interior and exterior window needs of all kinds. They are open Monday through Friday 8 a.m.-5p.m and Saturdays from 9 a.m.-1 p.m.
Waldrop and Co. Real Estate has now moved in to the old Cross Golf Cart building at 5736 Hwy. 45 N.
Grassroots Natural Candle Company has come back, having moved across the street to 127 Fifth St. N. Offering a wide variety of fragrance products (not just great candles! ), they are open Monday through Saturday from 10 a.m.-6 p.m. and Sunday from noon-5 p.m.
Twigs Nursery and Landscaping at 7653 Oktoc Road opened for business last week. MSU graduates Kody and Kandiace Brown offer a variety of plants, flowers, arrangements, seeds, pots, garden tools, Mississippi-made items, pottery and of course landscaping. It’s open Monday, Tuesday, Thursday and Friday from 9 a.m.-6 p.m., Wednesdays from 9 a.m.-4 p.m. and Saturdays 9 a.m.-5 p.m. Please click here for the original article. Columbus Mill Manager David Phillips recently spoke to the Rotarians at Lion Hills Center in Columbus about his facility, which was acquired by International Paper a couple of years ago, and the company’s plans for the future. 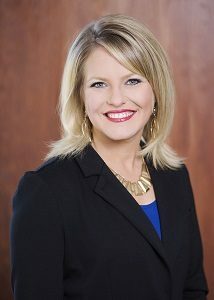 They have begun a new initiative called “IP Way Forward,” having already invested $135,000 within the local community as a way of giving back to the good people of Columbus. Their initiative calls for the company to focus on “[I]nvesting in people, sustaining forests, improving the planet, innovative products and inspiring performance.” This includes helping out the less fortunate by assisting with education, hunger, and medical programs. The mill currently has about 325 full-time employees, including thirty who were brought on board this year. They also contract up to a hundred workers per day, and their average pay rate is about $28/hr. Philips noted that the mill is largely self-sustaining, as they generate all of their own power by harnessing the steam generated by burning tree bark that might not otherwise be useful; they also use the surrounding 65-acre marsh to treat their wastewater. International Paper and their Columbus Mill are giving back to their local community while making products that we use every day — and THAT’S Good for Business! 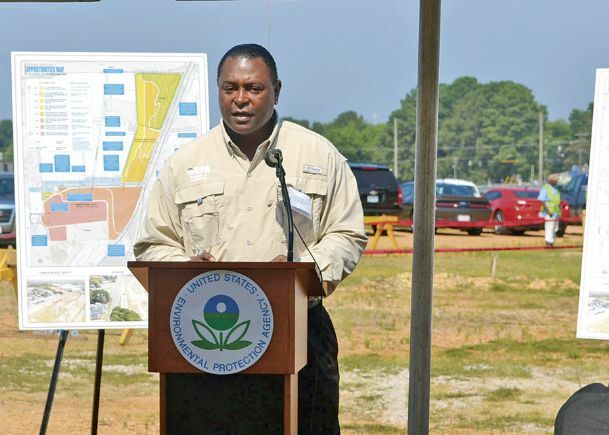 The EPA recently brought together local officials at each of ten Superfund cleanup sites across the country in order to recognize the solid progress on each of them, and the Kerr-McGee site here in the Memphis Town area of Columbus was one of them. In part, they celebrated the fact many of the 42 officially-recognized recommendations from a list put together last year were things that the KMG cleanup crew had been doing for as long as seven years already: “We’re already on the cusp of that . 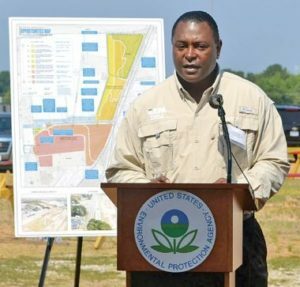 . . We’re already taking early actions in this community,” said EPA Region 4 Superfund Director Franklin Hill. Kerr-McGee once had a wood treatment plant here that was in operation from about 1928 to 2003; the resulting waste product, creosote, contaminated the site and local grounds, making it one of the 1,800 Superfund sites in the US, and one of the top 30 “priority” SF sites which are being given special attention and expedited funding. Market on Main dates in downtown Caledonia are Fridays June 1 and 22, and July 13 and 27, from 6:30-8:30 p.m. If interest warrants, more dates may be added in August. For more information, interested vendors may contact Boltwood at 662-251-2875 or visit facebook.com/marketonmaincaledonia. There is no fee to participate. Please click here for the full article. West Point florist Scott Reed, owner of Petal Pushers recently received official word from The White House last week that he was accepted into the 2017 holiday volunteer program. He will serve as part of a volunteer team that will go up to the big house on Pennsylvania Avenue for a four-day decorating spree, along with others who have successfully petitioned to do so. “It was really exciting to see something that I’ve wanted to do for so long come to be,” Reed said. “But I was automatically a little bit nervous because, well, I’m decorating the White House.” He has applied for the program multiple times since 2000, and was elated that he has finally be selected to help. Reed went to MSU, where he earned a degree in ornamental horticulture. 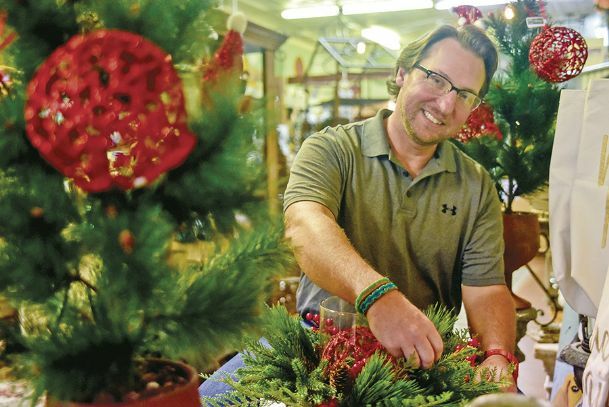 This eventually led to his opening Petal Pushers, a shop that specializes in making floral arrangements, as well as selling gifts, collectibles, and antiques to go along with them. His shop is located at 651 Commerce St. Please click here to see the full article. Fox News also covered UAS research at MSU, and went to North Farm to take a look at drones used for crop surveyal: “Increasingly, people are beginning to figure out that drones can do many things more efficiently and safely,” Luxion said. He went on to say that many jobs currently (or formerly) performed by manned aircraft that might end up being done by drones in the future include those which are hazardous, dirty, or just plain monotonous, including routine surveys and hazardous material applications. Starkville Community Market will be open this Tuesday from 4-6 p.m. at Fire Station No. 1 Park. SCM manager and Greater Starkville Development Partnership special events coordinator Jennifer Prather reports that roughly eight to ten vendors are expected to sell early spring produce and other goods at the event; more growers and producers are expected to join when the market’s Saturday offerings begin May 6. “We’ve spoken to new vendors outside of Starkville about new offerings, like baked goods and goat’s cheese and milk. We’re looking to increase the variety,” she said. The Market will be held at Fire Station No. 1’s greenspace, located at the intersection of Lampkin and Russell streets. 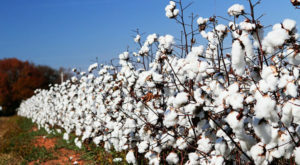 Buoyed by a notable increase in cotton prices, agriculture experts are forecasting a significant rise in the amount of cotton production in the state. “The outlook for the 2016-2017 crop is we are going to a fairly considerable increase in cotton acres,” said Larry Falconer, Ph.D., an extension professor with the Delta Research and Extension Center. “Cotton prices have rebounded. With cotton futures in mid-70s per pound range for the new crop, it looks like the margins for cotton production are much better than they have been in the past two or three years . . . Hopefully, it will continue to do hang in there at these levels or a little higher,” Falconer continued. This follows several years of low prices for the crop; in 2015, there were 320,000 acres of cotton planted in Mississippi, a near-historic low. In 2016, cotton acres planted went up to 450,000 acres. Falconer says that, if predictions hold true, there may be as many as 700,000 acres on the high end this year, depending on conditions and the weather. Williams said farm groups are also putting pressure on legislators to get it done as soon as they can just because of the low-price environment and the tight margins compared to where producers where with higher prices when the present farm bill was adopted. He said the sooner a farm bill is adopted, the better producers will fare in getting more money into the commodity programs. 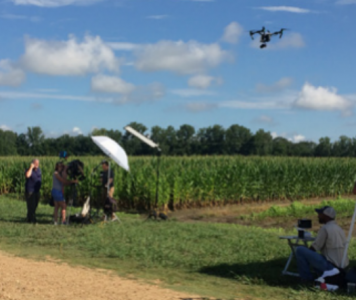 Agriculture is the number one industry in Mississippi with sales of about $6.2 billion a year and employment of about 30 percent of the workforce.